Have a look at the [Catalog, Photo and Video Documentation]! Media density is not congruent with urban density. Moreover it relentlessly expands seamlessly into suburban, rural, and rurban areas. Media Territories are describing the effects of independent densities with a surprising variety of stratifications hence challenging traditional categories. Features of public space like activism, consumerism, leisure, surveillance, to name just a few of the possible behaviors and plots are increasingly transforming Media Architecture. The Media Architecture Biennale 2010 will link stakeholders willing to shape the evolution of Media Territories in Economy, Urbanism, Design, Arts and Architecture. It is necessary to initiate the development of practices for the application of media architecture to urban, public space. Digital media increasingly surge into public space by way of new interfaces like media facades and cellular phone network applications and this leads to the interaction and fusion of different technologies and patterns of use. Concurrently cities are facing immense challenges like rapid growth or contraction, traffic and migration, power supply, economic and ecological changes. Media Architecture Biennale is an event that intends to shed light on the chances and risks that go along with change in appearance and social change with globalized cities and discuss alternative forms and contents of new formats of architecture and media. The cooperation of practice and research involving diverse stakeholders and experts of all kinds of urban fields are in the forefront of this event. 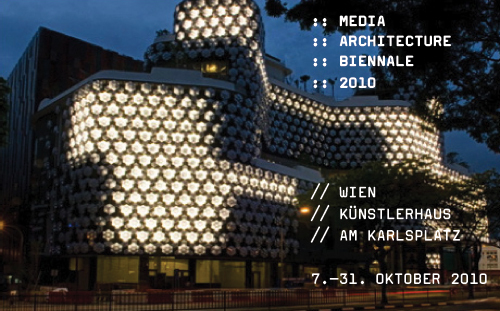 Organiser and host of The Media Architecture Biennale is the ‚Media Architecture Institute’, which is based in Vienna. The institute was founded in the fall of 2009 and developed from the ‚Media Architecture Group’, which has, on an international level, been working on the topic of media architecture and digital media in public space since 2003. We started collecting media architecture on our very popular blog www.mediaarchitecture.org in 2006 (and the website has received between 50.000 and 100.000 hits per year). As Media Architecture Institute and in our self-conception as platform, we see our contribution in provoking and promoting multifaceted discussion of this topic at an early stage. An open and perpetually growing, interdisciplinary network of architects, light and media designers, artists, engineers, industrial partners and other experts from academic and economic fields has developed from past events. Media Architecture Biennale 2010 comprises an exhibition, a conference and workshops, which are closely coordinated. Some of the projects on exhibit are discussed in the context of the conference. Topics of the conference are illustrated by objects on exhibition. Events are planned so that they offer the best possible framework for the discussion of current topics, for getting to know each other and for the development of project ideas. It is planed to hold the event bi-annually in Vienna in the future.